Jello Biafra's new single is called "Shock-You-Py!" 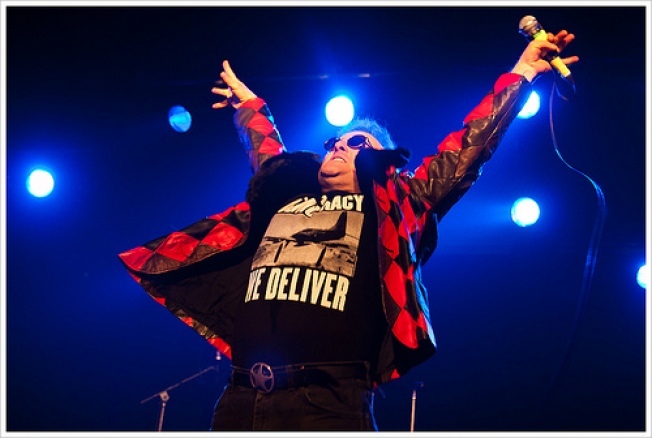 Jello Biafra has a storied history with San Francisco, including putting the city on the international punk map via his group Dead Kennedys and even running an unsuccessful yet attention-grabbing campaign for mayor of the city in 1979. His latest song, recorded with the Guantanamo School of Medicine and released last week, is called "Shock-You-Py!" While it's no surprise that Biafra would continue to dabble in the political and be both simple and clever at the same time, it is unclear what took him so long to speak up with an anthem for the Occupy movement. Expect a full-length album at the top of the year, reports SF Weekly. East Bay rockers Green Day recently released a new single and 3D video called "Oh Love," the first taste of what appears to be a super prolific time for the group. Rolling Stone announces three new Green Day albums that are expected to drop between September and January: ¡Uno! (September 15), ¡Dos! (November 15), and ¡Tres! (January 15). If all the songs are as relaxed and cohesive as this, the band's audience will surely swell even beyond its mammoth fanbase. It's been a little over a year since Kreayshawn — also known as 22-year-old Natassia Zolot, who grew up in Oakland and still identifies heavily with "the Town" but now lives in Los Angeles — became a viral video sensation and racked up millions of views and a million dollar record deal for her love-it-or-hate-it rap song "Gucci Gucci." This week, she glams up to offer a new visual taste from her forthcoming debut album Somethin' Bout Kreay with a new cotton candy pop single called "Go Hard." It's the first real evidence that Zolot, who began her creative endeavors as a video director, is experimenting with sounds outside of hip-hop — which might be the key to future success.